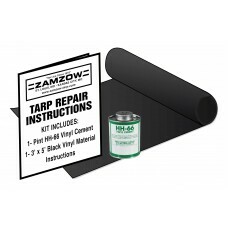 Vinyl Tarp Repair Kits, contains a pint of glue and 3' X 5' piece of vinyl and directions on how to use. Various colors available. Vinyl Repair Kit - Black. Contains: pint of glue, 3' X 5' piece of vinyl and instructions for use. ..
Vinyl Repair Kit - Blue ..
Vinyl Repair Kit - Gray. Contains: pint of glue, 3' X 5' piece of vinyl and instructions for use. ..
Vinyl Repair Kit - Red. Contains: pint of glue, 3' X 5' piece of vinyl and instructions for use. ..
Vinyl Repair Kit - White. Contains: pint of glue, 3' X 5' piece of vinyl and instructions for use. ..